The first boat was a Redfish Return which I named "If n'When II" after a boat that my grandfather had. It was built primarily from knotty western red cedar with Port Orford cedar infill on the deck and mesquite for the outer stems. This boat was completed in February 2002, and permanently joined the training fleet of Journeys West in March, 2012 after being on loan to them for a year. 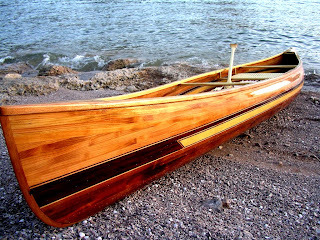 The second boat was a Morris influenced Greenland style Skin on Frame which was named "Knot Much" well after the fact. This project was started over the Thanksgiving weekend, 2002 and completed in February, 2003. As is typical for a SOF boat, it was very light, rolled nicely, but hid all the interesting woodwork inside. It didn't stay in the fleet very long after the next one was built. The third boat, "Knot Likely," and my hands-down favorite kayak is a Redfish King built primarily from western red cedar with new growth Port Orford cedar on the deck. This boat was started in April, 2003 and complete enough to take on a Green River trip in late September of that year. 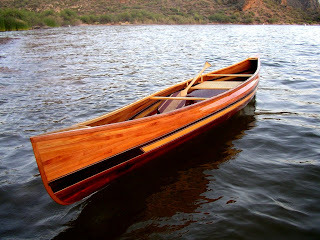 The construction of this boat was featured in an Arizona Game & Fish television program that year. It remains in my collection but doesn't get used much. Photos of the first three boats were taken in a little cove at the lower end of the Black Canyon on the Colorado River below Hoover Dam. "Too Knotty" was based on the Birder 2 design from B&B Yachts and was built in the Spring and early Summer of 2004. It was completed in time to take it to the Northwest in July of that year. 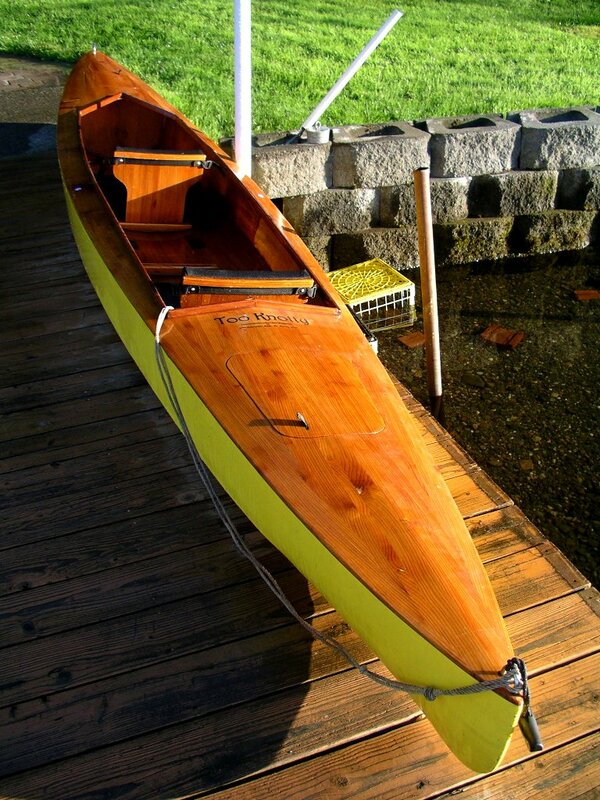 This boat was designed to be paddled solo or as a close-coupled tandem, modified with a strip-built deck instead of the plywood deck of the original design. 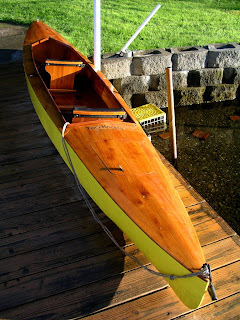 After taking a couple years off while building toys for my grandson, I built "Knot Again" based on the Soul-Mate solo canoe design. This boat is primarily western red cedar, with paduk and Alaskan yellow cedar in the feature stripe, and mahogany for the outwales. Inwales, thwarts, and seat are Alaskan yellow cedar. This boat was started in January, 2007 and was completed in time to take it to British Columbia's Powell Forest Canoe Route in July, 2007. This boat was built primarily to haul the groover for Green River trips but it seduced me. 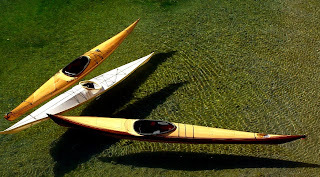 Now, with very few exceptions, I'll choose a canoe (either this solo or a Souris River Quetico 16 tandem) and single bladed paddle for flat-water trips, leaving the kayak hanging in the garage. In December, 2013 and January, 2014 I helped with the construction of a wooden dory. It was built as a replica of a dory that had been built in 1962 and used on a trip through the Grand Canyon that year, just prior to the completion of the Glen Canyon dam. I was privileged to go on a Colorado River trip through the Grand Canyon in March, 2014 and see the Susie Too replica in action. She was rowed by a number of different boatmen during the trip, giving each of them an opportunity to experience an historic dory first-hand. The 7th boat was also not mine. Knot Too Shabby was a joint project with a former employee and long time Green River trip participant. We started this project in early February, 2014 and had it on the water in early May in spite of other commitments. It is a 12' Wood Duck design built from Chesapeake Light Craft plans but with a number of modifications. All of the posts related to Kathy's Kayak are available here, but in reverse sequence. John, Greg would surely appreciate your workmanship with the Alaskan yellow cedar. These are amazing, my friend. I have to say, that reading your river blog sure makes me miss our little 80' feet of home. Thanks for capturing it in such beautiful simplicity. 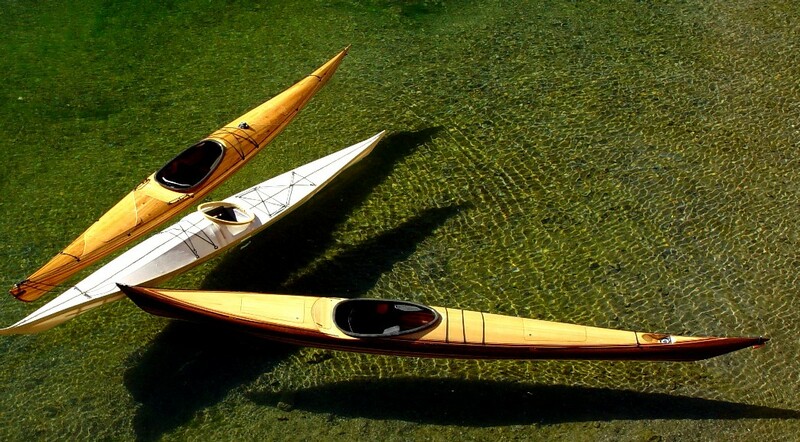 Kinda like these canoes. I was telling folks today how much I enjoyed the Grand Canyon trip. 18' is always enough! Someday I need to get you in my solo canoe. It will ruin you for anything else on flat water.